Our location allows for quick access to the main tourist destinations in Tiberius, The Sea of Galilee and the surrounding area, as well as the Golan Heights. For your convenience we have a selection of spacious rooms, equipped with shower and bathroom, air conditioner, refrigerator, and free Wi-Fi. Some rooms have a balcony. The rooms are suitable for individuals, couples, and families. Available to our guests are 2 equipped kitchens, so our guest can make Self prepared meals. 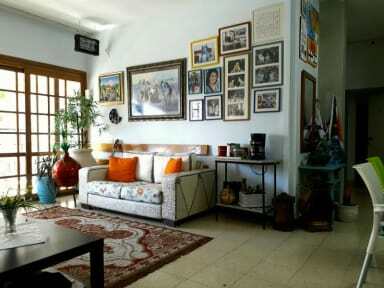 A luxurious living room, were you will get to know interesting people, exchange stories and plan your next day trip. At the Hostel there is a well-kept garden and patio. excellent for barbecue evenings and a glass of wine on a mild summer evening. The Hostel provides private parking, luggage storage, laundry services (for a fee), maps and traveler information. We will be happy to help and answer your questions. We give a 'home away from home' for travelers, personal attention, and a high level of cleanliness. Customer have wrote: ' ..... Inspiring place...' '... Cozy with a luxurious atmosphere ...' .'.... sleek and tight...' '.....very clean showers ....'.